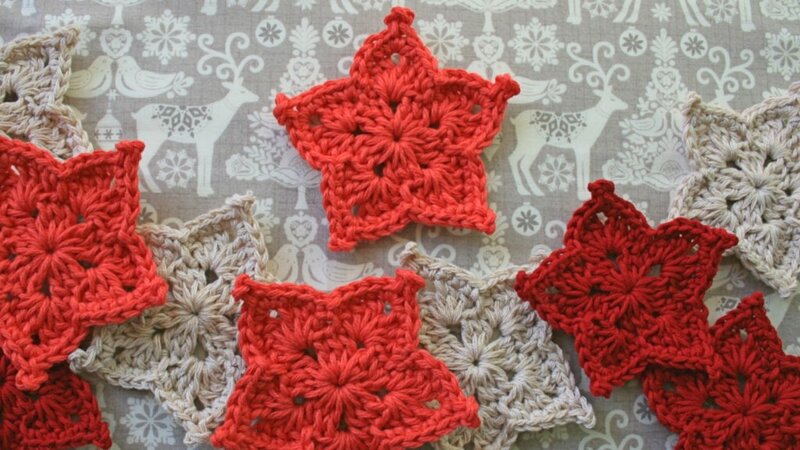 Get your hooks out for my free crochet star pattern. Great for Christmas and, well, any time of year. 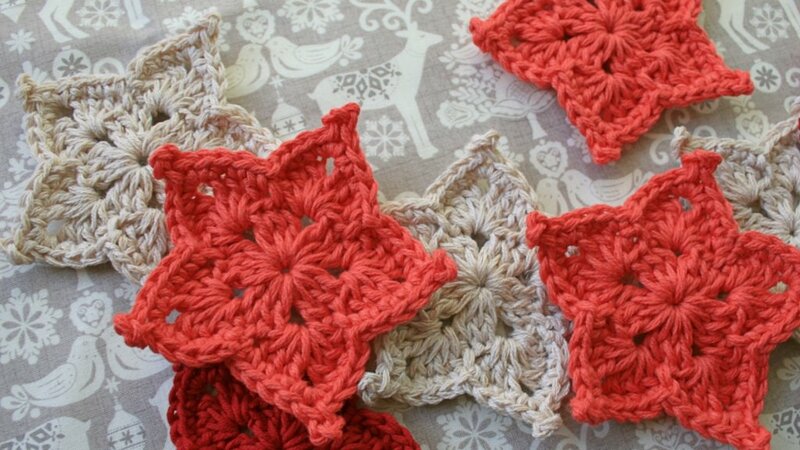 Fill your world with pretty crochet stars with this easy pattern. Yarn: Light Worsted / DK weight. Any yarn type will do nicely but cottons are really good at holding the shape. Picot – ch 3, sl st in top of last sc worked. With your color of choice, ch 4 and join to form a ring. ch 3 (counts as 1 dc), 2 dc into ring, * ch 2, 3 dc into the ring. Rep from * three more times, ending with ch 2. Join with sl st to top of first dc made. You will have 5 dc groups and 5 ch2 spaces. sl st in next dc, [ skip next dc, in ch2sp work (3dc, ch2, 3dc), skip next dc, sl st in next dc ] five times. sl st into next dc, ch 1 and sc in same place, sc in next two dc, * in ch2sp work (2 sc, picot, sc), sc in next three dc, sl st in sl st of previous round, sc in next three dc. Rep from * three more times. (2 sc, picot, sc) in ch2sp, sc in next three dc, sl st in sl st of previous round. Weave in ends. To ensure the star keeps its shape wash the star and pin out to shape. Spray with laundry starch and leave until completely dry. I’d love to see what you make with this pattern, so don’t forget to post your finished stars on Ravelry and social sites and link to me so I can find them. 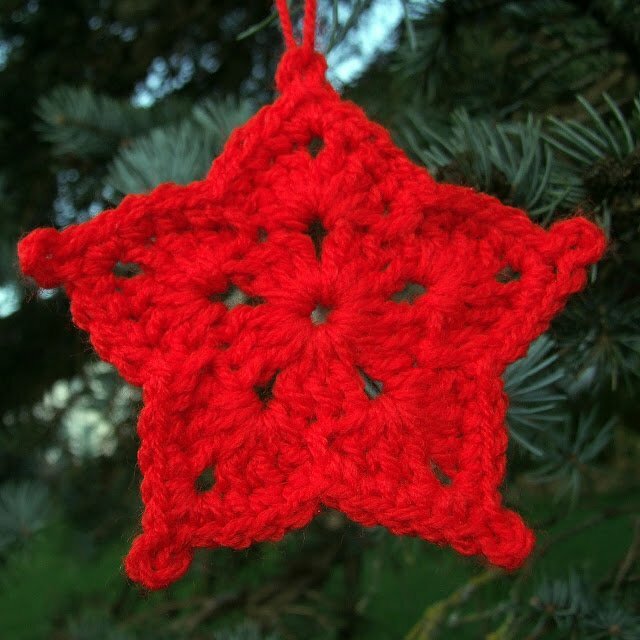 I hope you enjoy this free crochet star pattern! Copyright 2010, Leonie Morgan. 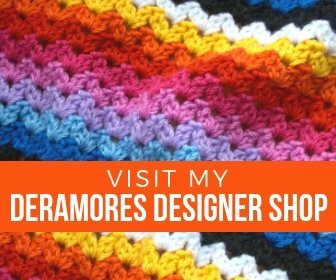 I am happy to share this pattern with crocheters and knitters. The pattern may be used for non-commercial personal or knitting group use. This pattern is not to be used in any publication in print nor should it be reproduced in electronic/digital format without permission. Please email me at [email protected] and let me know if I may print this pattern off for my own personal use. I love this star!! I too love to crochet and can be found at any time with my enormous "bag-of-holding" that contains much more than on projects worth of yarn and such! Have a fantastic day! Wow! This is a lovely patten! Thanks for sharing! like this before. So great to discover someone with genuine thoughts on this topic. Seriously.. thank you for starting this up. This website is something that's needed on the internet, someone with a little originality! How do you crochet the picot? I looked for some instructions online but there are different versions and I don’t know which one you used. I don’t know if I did it right. I got confused between the end of round 2 and the beginning of round 3. Round 2 ends with a sl st but round 3 begins with a sl st as well (‘sl st into next dc’). So my question is – is that supposed to be the same sl st? Because the first time I did it I crocheted sl st in 2 consecutive dc and later I realized that I was missing a stitch.